In today’s recommendation economy of referrals, ratings and recommendations, most people make up their minds to purchase a product or service based on the endorsements of friends, online reviewers or trusted business acquaintances. That’s why we are fans of testimonial videos. We recently finished shooting a video testimonial for our client Birko Corporation. The folks at Renegade Brewing Company in Denver gave a great endorsement for Birko’s brewery cleaning and sanitation products. 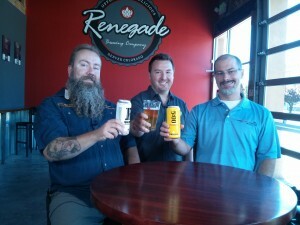 Many thanks to Renegade owner Brian O’Connell (center), Wild Goose Engineering marketing director Roger Walz (left) and Mobile Canning Systems co-owner Ron Popma.